Minnetonka Tramper Ankle Boot - The Tramper is one of the hottest sellers from the Minnetonka collection (if not the hottest seller). This boot has a bit above the ankle height with long fringe coming from the top of the boot shaft. Minnetonka Hi Top Back Zip Ankle Boot (shown in left photo) - Here is a gorgeous style, one of our favorites here in the entire collection. The little "extras" are what set this one apart from the rest. 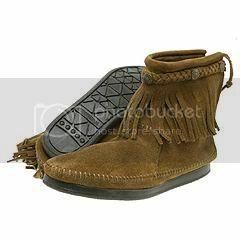 Minnetonka Suede Ankle Boot - This is also a cute style moccasin, with more of a "shoe" style than the others. Zig zag edging and contrasting stitching sets this boot apart without being "too too". *The* Minnetonka Ankle Boot - This is actually named "Ankle Boot" and can function as both a warm and comfy house slipper or be worn with the shaft up for a "go anywhere" style of boot. This one is quite popular as well, and based on the study of consumer reviews, this boot is actually worn more at home than anywhere else. Favorite style: Our favorite style among this bunch is the Hi Top Back Zip Ankle Boot - love the style of this one. Shopping: All of the styles listed just above should be easily found in the merchant listings on this page. Our favorite resources for these boots include Zappos (best selection), Shoebuy and Endless.